As usual lately, this is a last minute meal that is comprised of what’s left in my kitchen. I seem to go for long periods of time where I plan meals and shop accordingly. Then I have long runs where I’m busy and end up using leftover produce and other ingredients. This meal didn’t really have an initial plan. 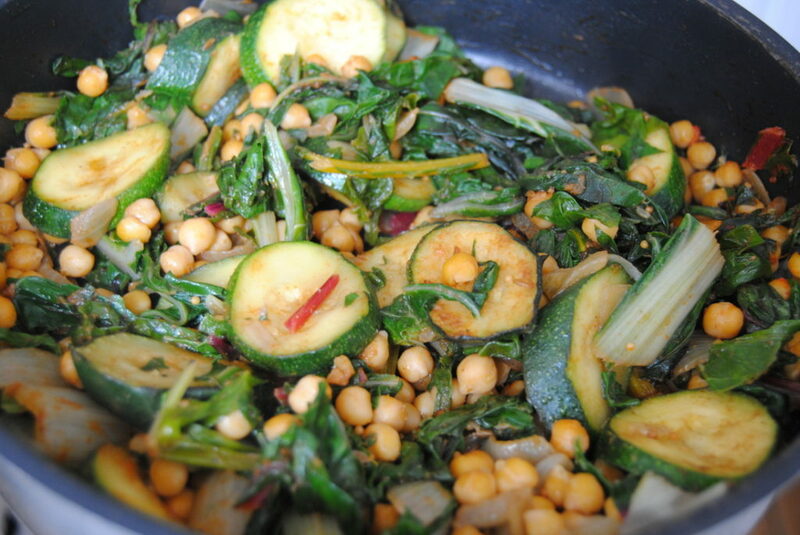 The only thing I knew was that I had zucchini (courgette), Swiss chard and chickpeas. I mixed a few ground spices with a little water then added garlic and ginger to the pan. Spices will take an average meal and add lots of flavour to it. Mix the 4 ground spices with enough water so that it forms a thick paste. Heat the olive oil in a pan over medium heat. Add in the spice paste, then add the zucchinis, Swiss chard and chickpeas. Cook for about 10 minutes then add on top of brown rice or quinoa. Enjoy!